500g closed cup mushrooms, halved or quartered. 250g ( 2 medium) onions,thickly sliced. 8 thick pork sausages,cut in half. 250g ( 2 large ) carrots,peeled and cut into large chunks. 350g ( 2 large ) potatoes,peeled and cut into large chunks. 2 tablespoons freshly chopped thyme. Heat half the oil in a large frying pan and fry the mushrooms on a high heat for about 5 minutes until golden. Season well with salt & pepper and transfer them to a large dish and set aside. Add the remaining oil to the pan along with the onions,sausages and bacon and fry for about 6-8 minutes untilthe meat is browned but not cooked through. 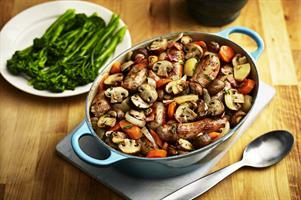 Tuck the vegetable chunks around the sausages and onions,sprinkle over half the thyme and season well. Pour in the stock (or Guinness) and cover the pan with a tightly fitting lid or a large piece of foil. Cook over a medium heat for 15 minutes, then stir in the mushrooms, recover the pan and continue cooking for a further 10 minutes or until the veg is tender and the sausages have cooked through and almost all the liquid has evaporated. Stir gently to mix everything and serve sprinkled with the remaining fresh thyme and some green vegetables of your choice.